Where Facebook is the friends network and Twitter is the quick information network, LinkedIn is the professional social network. It is where people have display profile pictures of themselves in a suit and post about articles that make them appear professionally involved and switched on. Aside from this it is an invaluable tool to network, engage in discussions and plant your professional services right where your audience are the most alert. LinkedIn is the second most used social media website in Australia, rising above the likes of Twitter. Due to its professional user base and purpose, the content and interactions here are of a different nature to that of other social networks. When it comes to professional skills, there are 108K members with health care listings, 55K in community and social. When should I put my Business on LinkedIn? The short answer – if your services are of interest to the professional world, and if your content can help them better assimilate the ideas that drive value to your business. Just like other social networks, if the effort you’re putting into providing insightful knowledge does not result in clients appreciating your offering more, there’s not much point. Even on LinkedIn people will skim over the details. In your company description tell a story of what your business means and how it came to be. Don’t go too overboard and leave some room for people to want to find more information. Once you’ve done this and have added your logo you should be following likeminded ‘influencers’ and popular thought-leaders within your industry. Learn from their delivery, learn from their sympathetic language, and then add your own thoughts! Don’t be afraid to reuse sections and content that has been previously successful, several topics have seasonal interest and will be all the talk again in the near future. Scoping your audience also means sharing your LinkedIn page link on other social properties, your website, and outgoing emails. Friends, colleagues, other departments, clients, they should all have something interesting to read when they get to your page. LinkedIn is not the place to constantly tout promotional details or discounts, it is an opportunity to get your professionalism out there on a more personal level. Company updates and information are fine, especially when you’re able to connect it to some interesting advice content or a hot topic, but you need to give back before you receive. Think one directly company related post for every four pieces of strong value creating content for your readers. In a recent article we gave you a rough posting on a small time budget outline, and how to engage users in social media whilst keeping alignment with your brand. This week, we’re going to put the rules of engagement to the test and give you the facts of what does and doesn’t work in Facebook posts. We will give you something that you can use with a simple engagement plan to have a strong long term presence without worrying that a smaller time capacity will limit your abilities. When posting to Facebook it is important to share interesting and engaging content (and don’t forget the golden rule – be social) that you yourself would get involved with. People tend to skim through their Facebook newsfeed even more so than twitter, so making lengthy wordy posts won’t help your cause. 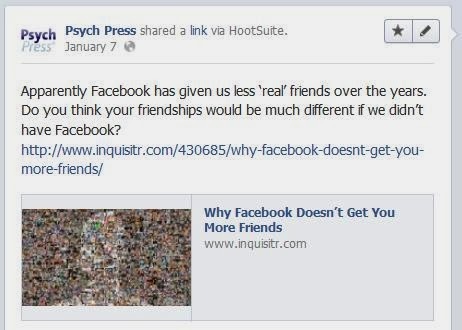 Buddy Media did a study on the top 25 brands on Facebook and returned key guidelines to posting. · Posts with less than 80 characters are much more engaging than anything longer. Due to the real estate they take up, photos are the most engaging thing to post on Facebook. · Using URL shorteners: websites such as bit.ly or hootsuite that can shorten your URLs are very popular but think twice; users are more likely to click through on full htmls. Why? Usually this is because the link will contain a known domain or words that they are looking for so they know what they’re getting themselves into! · Posting between 8 PM and 7 AM showed the greatest engagement, however do not take this rule too close to heart, instead find what works best for you. Make it a habit to think back to what you’re trying to achieve; if it’s important for clients to click on your links then business hours might work best. If you want people to read through an article or read an update in their own time then go for 8pm. Some people shy away from scheduling posts as they’re not at their desk, but programs such as Hootsuite allow you to schedule whilst still choosing images and crossing multiple social platforms. People generally understand that staff cannot get back to questions at all hours of the day. · 2 posts per day is a healthy amount of posts, doing more than this should be saved for special occasions as it may annoy certain viewers. With this in mind, posting up to 4 times per week receives the highest engagement. · The most engaged day to post was shown to be a Thursday, so consider making your more important or prominent posts on this day. 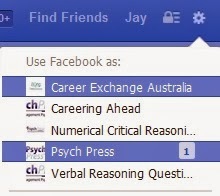 You don’t have to delve too deeply into Facebook insight statistics to find out what your best days have been, so experiment! · Engage users with questions, and call to actions. Try not to post a hard sell, Facebook is not the ideal place for this. If you do have promotions of interest to your key group, $ off statuses receive far more interest than % discounts or clearances. For getting other calls to actions, actually asking people to do things works best. Getting people to “Like,” “Post” “Submit,” “Comment,” and “Watch” work the best and coincide with the Facebook language people are used to, then terms such as “Share,” “Become a Fan” or “See” receive less attention. · Don’t forget: if you’re posting about current news or events; try to create necessity which can link to your product. · Don’t be afraid to comment on other pages’ statuses. Look for pages that may contain interested parties if they are active and also engaged. You don’t want to overdo it or barge in and link to your page, have something to add to a discussion and give your insight. Give people a reason to listen to you not a demand. · In essence: post what you would read and respond to, keep it simple, be timely and up to date, build up an identifiable rapport with your audience and remember – Facebook is an extension of your brand with added personality. It’s easier than it looks fitting your Businesses into the Twitter culture. We show you how. Twitter is more than just posting what you had for breakfast and reading about other culinary feats. It is a powerful information tool that is excellent at delivering short, sharp messages. Where Facebook employs its post ranking algorithm EdgeRank that filters out unpopular Facebook posts, Twitter has no filtering mechanism. The catch here is that it is harder to appear in a user’s stream. Twitter has its own vocabulary which can be daunting at first, however hopefully we will break it down for you. 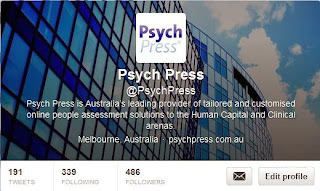 Firstly, on your profile page you can see your ‘Tweets’, ‘Following’ and ‘Followers’. A Tweet is essentially a status update. Twitter limits this to just 160 characters and only text, fortunately links are easily shortened. ‘Following’ shows you the activity of other Twitter accounts you have subscribed to i.e. following, whereas ‘followers’ are the people who have subscribed to your twitter account. 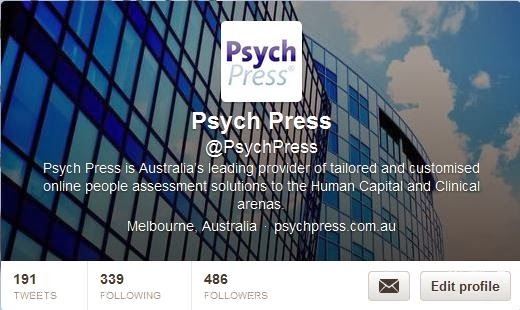 This is Psych Press’ Twitter profile. In a profile you are allowed to have a description of up to 160 characters, a location and a web address. When looking at your tweet stream you will notice people using @ and # symbols in their tweets. An @ symbol is used to talk to or mention a particular person/profile through using their twitter username. When clicking reply on a tweet, twitter will automatically put who you are replying to as @username at the start of the tweet. An example of a Tweet by Patrick stokes. NOTE of the use of @ and # symbols in his tweet. So in this example @latrobe means that Patrick is both mentioning La Trobe as he is speaking there and informing Latrobe that he has mentioned them (you get emailed if someone mentions you in a tweet, unless unchecked in settings). As a result La Trobe has “retweeted” his post. A retweet happens when another user likes your post and decides to share it with their twitter followers. This way your post will appear in the feeds of people who are not following you but are following the user that retweeted you. The other users are informed who retweeted the tweet by the note under it. Using the # hash symbol in a tweet is to hash tag the Tweet. In the above example the hash tag is #seewhatididthere. Hash tags make your tweets searchable, furthermore when clicking on a hash tag Twitter will show you a list of all other recent tweets from anyone in the world who recently used that tag. Using hash tags makes it easy to track and join in conversations, which is a great way to find people to follow who you may be interested in and vice versa! 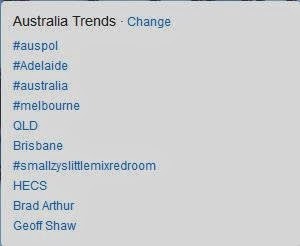 Twitter also trends current topics, and more often than not they are hash tags. An easy way to gain some publicity is to tweet using a hash tag for a trending topic and socialize with others in the trend (as they will with you, if your input is useful). The uses of Twitter for business vary dramatically. Some businesses use it to post all the latest current sales and deals. Others use it to post about general business updates. Then there are those who use it to post articles and interesting links. General Twitter guidelines suggest posting from 10 per day to 3 per week. The trick is to find something on a time budget that will work for you. There are services such as Triberr which you can use to automatically retweet other people’s content, however make sure you trust whoever you will be automatically retweeting if this is the avenue you chose, you don’t want to mention an advertiser or completely irrelevant material. Retweeting - You can click ‘retweet’ to repeat someone’s story exactly, although sometimes it can be truncated if it is too long. If someone says something about your business and you’d only like to repeat a part of it, it is widely accepted to tweet “RT” short for ‘retweet’ before their input. Following - Remember to follow any happy customers and anyone who gives you good publicity. This should be done as soon as possible, that way they are more likely to keep in touch again in the near future, or thank you for following. It is also a good idea to follow anyone that follows you, but avoid any spam looking accounts or adult content profiles. If you are followed by someone who looks like a potential customer, follow them back and thank them e.g. “Hi @Barbara. Thanks for the follow J” Just be sparing with this, as you don’t want to appear desperate. Generally you would not follow competitors - it’s not a good look if people find an alternative service while surfing your profile. Other groups to follow are: opinion leaders relevant to your industry, publishers who make news stories related to your industry, any partners or affiliates of your business, adding staff and having staff add you is also a good idea. The key is to make it a frequent habit! Tweets – At first, you will be very tempted to tweet content that focuses heavily on gaining attention such as adding on very general questions to the end of each tweet or appearing amazed at the news you’re sharing. Twitter savvy users will catch onto this behaviour immediately, see you as less of a ‘human’ business and ignore you. Instead, put a bit of humour into what you’re posting and only ask questions if there are obvious opinions to be had. You don’t always need to add a link or join a # hashtag, sharing something timely or interesting about the business can be just as good. Remember, many enjoy using shortened slang online but you’re a business so watch your spelling! Searches – People don’t always use a hashtag for the topic they are Tweeting about, so frequent searching is very important. Be sure to search for your business name (or similar variations that people may write) often, and reply where necessary. Be sure to search for key terms related to your business to see if anyone is looking for your services. Tapping into those “Hey, anyone know where I can find a good xxxxxx?” tweets can be priceless! As long as your tweets are called for you will remain relevant and helpful! For you, joining in on discussions and news updates related to health and then linking it back to your product is quite easy. There are always new findings and updates going on related to your profession that will undoubtedly hit Twitter. If you can get into these updates or trends and add your own expertise you will reach new crowds and hopefully focus on a centralised group closer to your location! With over a billion users, Facebook is not one to ignore. However many fall into a pattern of letting their page get left behind, either by not responding to questions or not updating important features. As a golden rule – to make Social Media work, you must be Social. We look over the basics and important setups that you may have missed even if you do have a page, to make sure you’re on a strong ongoing path of connecting to others! From an already active account create a new page for your business. Once you have created a page you can access and edit it from the drop down at the top right hand side of the window. To go back to your personal profile just repeat the same process. Facebook provides an admin panel for managing brand pages. It gives you a notification panel which has all the activity that has recently been occurring, and a panel of all your most recent likes. The insights box provides you with a timeline of the effectiveness of your posts and like demographics, this can currently only be accessed after 40 likes. 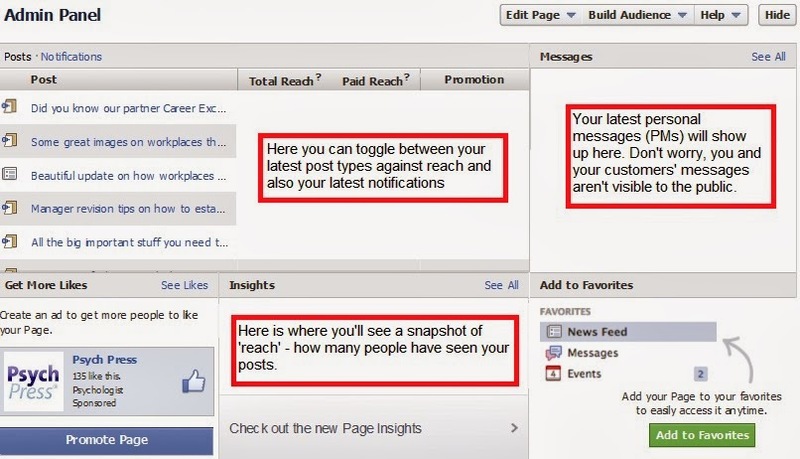 Hovering your mouse over the data will show the numbers of people who are talking about your page and the number of people reached by a particular post, and the dates and times of posts. If you make sure you’re satisfied with how your page starts you won’t have to constantly worry about and attempt small updates. Ensure that you make your profile look aesthetically pleasing. Ensure you are using high quality pictures for the cover photo and profile picture, Facebook can auto crop these though if it doesn’t fit well be sure to resize the originals. Fill in all the relevant information, especially in the about area and the link to your website. Here is an example of a fantastic facebook brand page. Notice the likes to talking about this ratio. 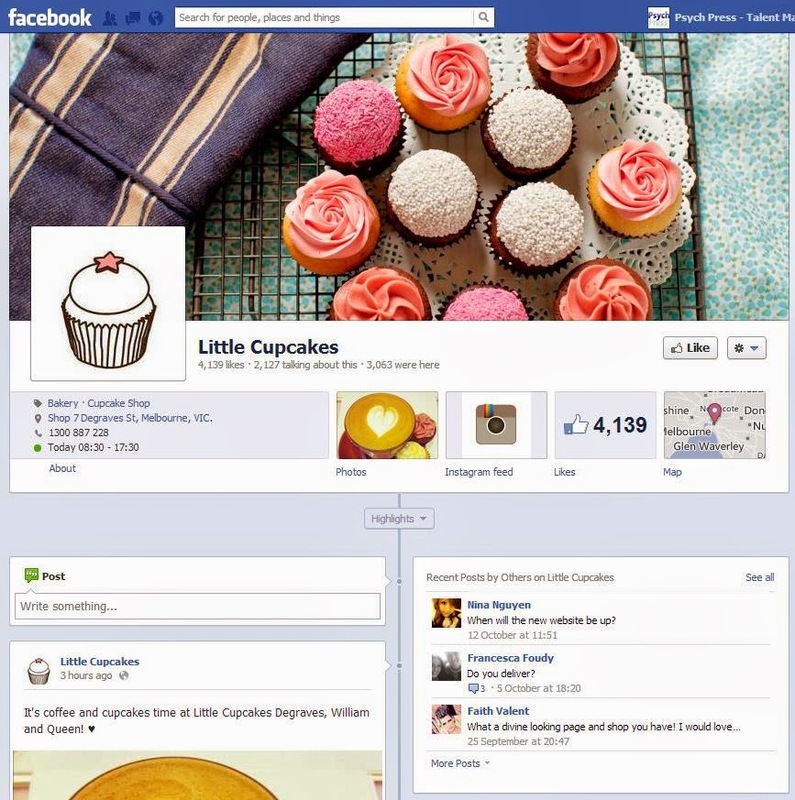 Roughly half of little cupcakes fans are engaged by their page. Likes – The total amount of people who have liked your page. It is just as important to see if this number is dropping, which could mean you have annoyed or misled people with your posts. Talking About This – The average number of people creating a ‘story’ about your page, meaning they have commented/ liked or otherwise interacted with your posts. This is a good weekly indicator of generally how popular your output is. Were Here – This is more of an option for those who visit your physical location, some businesses heavily reliant on foot traffic will run promotions to push the use of this so that customer’s friends can see they were there. If it is not relevant or if you don’t think people would like to post that they “Were Here” then it isn’t completely necessary. Post Likes and comments – Don’t fret, it may take some time for these to reach a higher pattern and develop a healthy number of ‘regulars’ who might always have something to add. How can it help? Does it suit my business? What pages should I invest time in? Nearly all companies without social pages (and even those with them) have seasonal discussions and arguments about the viability of this ever popular tool. Usually the end outcome is something along the lines of “Fine, make a page but don’t spend too much time on it!” or “Don’t make a page, when we see the dollar value we’ll do something then”. Unfortunately, neither of these answers really helps reach a sustainable outcome. With small and allied health related businesses in mind, we’ve put the below ideas together to help your next Social Pages discussion, whether you have none or need to improve what you’re currently doing! How can a Facebook or Twitter page help a small business? With a low budget, you would be stimulating and aligning current interests and social activity to your business with relevant content. This means liking pages where your audience aggregates, joining trends that link to your offering and sending out both original and interesting external material to set yourself up as an expert and reliable ongoing source of information. Once you’re established, you have firm grounds to share updates about your website and anything else that your returning fans will be able to find value in (including using your products / services). Is my business the right business for Social Media? We would like to tell you all businesses need Social Media in some way but it’s important to be realistic. A cement mixing plant will find it nearly impossible to start and increase trending activity on Twitter when tweeting about the current climate of cement mixing materials. Why? It just isn’t as important as celebrity gossip or funny videos to the masses. We believe that all businesses (yes, including cement mixing plants) have a place somewhere in social media and can contribute as well as receive interest from the outside world with their content, but it’s all about relevance and commitment. Relevance – If you’re strictly B2B, start with a LinkedIn company page and see how you go. If your advice and instructions get some traction, extending with YouTube, blogs and other newsletter materials will empower what you’re already doing, without ever needing to delve into the Twitterverse. If you cater to consumers, no matter how niche, there is a place for you on sites such as Twitter and Facebook. Getting attention from short and catchy content will be easier for you, as long as you have something to offer that stands out and the benefits of subscribing to your pages are clear. This is a goal that we all have. Ideally, we should all be spending a little more time on Facebook, Twitter and LinkedIn (and even others) to really get the best idea of what our audience responds to and finds interesting and then build a well-backed framework that drives activity and sales through your website. Until this becomes more possible for a lot of us, we need to spend more time on our core responsibilities, but below is a basic framework you can use to get more from less! Week 1 – Create Facebook and Twitter pages (B2C) or a LinkedIn page (B2B). Fill out all necessary details and make sure the links between the pages and your website are clear. Week 2 – Now that you’re happy with how your page looks for now, start following and liking aggregated pages where your audience “meets”. Also be sure to add the link to your social pages to your website and online outgoing materials. Make a post that introduces your business and what people can expect on the page. Week 3 – So that your posts aren’t purely about you, share recent industry news updates that’s of interest to your audience. Make note of your news aggregators, Google alerts is a good starting point. Be sure that you’re not directing users to mounds of irrelevant advertising. Ongoing – Mix up your news posts with interesting updates or promotions from your business. If your business aligns to the advice side of content, be sure to circulate this regularly! Just make sure you don’t ever outweigh social posts with ‘product push’ updates or users will feel alienated. Keep an eye on what is getting more views, clicks and comments, and share around your updates with other staff so that they are sure to make good sense to fresh eyes! - Still not sure? Don’t worry, we’ll give tips on how to post well and manage different communities soon! Coming Up: We will take you through different social media options with advice on how to make the most out of each of them for your business. We will also give you that golden knowledge on how to manage your online communities as they grow to align your brand effectively!